I’d like to give Amanda a huge welcome to this blog and the book Echoes of Heather and Stone. 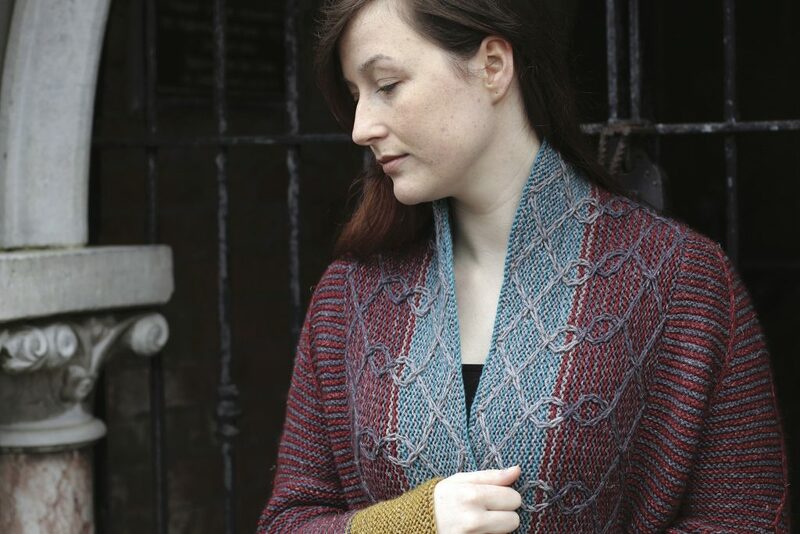 Amanda has designed a unique, beautiful, cardigan that really takes the ancient Irish theme of the book and makes it her own. 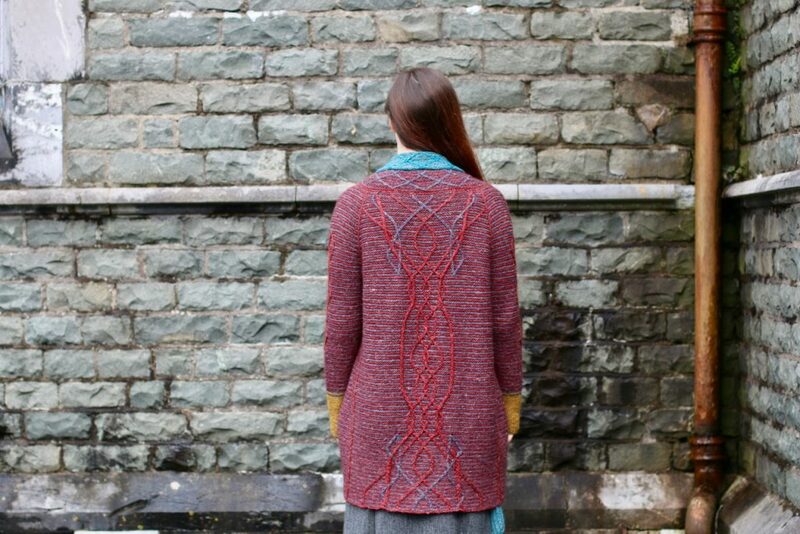 I think you’re going to love reading about her history and inspiration for the cardigan. Hi Amanda, Can you tell us a little bit about yourself and your creative background? I live near Ottawa, Canada, with my husband and the five small humans we made ourselves. (Actually, the oldest is now taller than me, so never mind on the “small” part.) I’m a voracious reader, and I daydream and get lost in my head quite a lot. My family accepts the weirdness, and we have a lot of fun together. I’m an artist, but for years I couldn’t paint consistently, and I didn’t know why. It turns out I was trapped in my undiagnosed-ADD brain, and during that time, I picked up knitting, and it was so soothing yet stimulating. I couldn’t put it down. It was my comfort and my creative outlet. I knit myself through all sorts of overwhelm, and over the years, I learned both about how my brain worked (and how to work with it) and more about knitting. I was lucky enough to take classes from knitting greats like Lucy Neatby, Sally Melville, Donna Druchunas, Nancy Bush, Cat Bordhi, and they were so inspiring and encouraging. I made it my goal to learn every knitting technique, try every sock heel, write better patterns, read every book, try every sweater construction. I joined the Ottawa Knitting Guild and met so many incredible local knitters, designers, dyers, and teachers. They’ve been instrumental in my professional growth. Ottawa is a great place for knitters. Now, I’m a knitting teacher and designer. I’ve been teaching multiple weekly classes for the last four years in almost every knitting technique imaginable, and I’ve been publishing patterns since my twins were born 11 years ago. I make knitting mistakes on purpose at home so I can learn to fix them really well, and I think my students like that I can help them with anything. And back to the artist thing: I’ve taken some great art classes over the years in painting, drawing, anatomy, sculpture, design, etc., and I do think those things help with my knitted designs, too. Everything I’ve ever learned smooshes together in my brain, rearranges itself, and comes out in sometimes-good new combinations. 🙂 Art influences knitting, and knitting influences painting (I tend to paint and draw stitches as well as portraits). I strongly believe that knitting IS art. Nothing is ever wasted. If you’re doing something right now that you love but you worry if it’s a waste of time, I can tell you right now, with absolute certainly, IT IS NOT A WASTE OF TIME. Even if all it does is make you happy, that’s one more happy person on the planet. We need that! Carry on and spread the love. Can you tell us how your design process started for Talamed? Carol sent me so much inspiration that my brain almost exploded from happiness! I dove in and learned so much about ancient Ireland’s history and beauty. The Ogham writing, the decorated stones at the passage tombs, the Book of Kells — they were all so full of design and interest, so rich in history and thought. I could see how one generation influenced the next. It was amazing to me as a Canadian who’s used to living on a shallow surface of history. Here, 200-year-old buildings are old. I love imagining how it must be to live surrounded by and immersed in the echoes of millennia. Within Echoes of Heather & Stone can you tell us about your inspiration for the design and then how it translates to your finished piece? To narrow my ideas down, I decided to stick to my most recent obsession — reversible slip stitches — and incorporate them into something that I myself would like to wear. 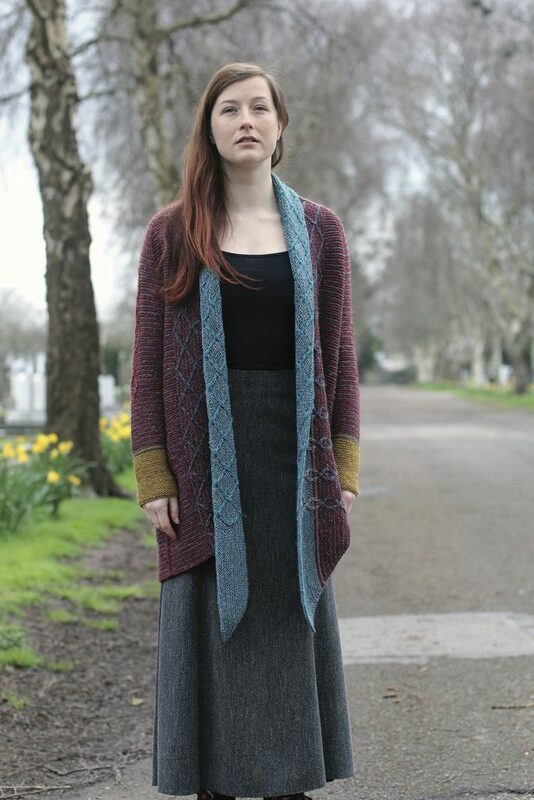 I’ve been wanting to make a pattern for an open cardigan that I could wear with a tunic and leggings, with wide front bands, a shawl collar, and an angled front hem line. I knew the reversible slip stitches would be perfect on a turned-back collar, where both sides would need to be the public side. The Book of Kells, full of its overlapping, intertwined lines, filled my mind with ideas for cables. I wanted to create a show-stopping back cable that followed the same design rules as the illuminated manuscript: intricate lines and loops crossing always over, under, over, under, with no beginning or end. But then I had to fit it into stitches and rows, and that required a lot of back-and-forth between sketching and knitting and charting and ripping. I gave myself a break and didn’t require the top or bottom lines to be joined in infinite loops, but I did manage to sneak a few continuous lines into the middle and onto the front bands, and I love them. The cardigan shape itself is quite straightforward: it’s just a top-down raglan made of garter stitch. All of the interest and challenge comes in the form of the slip-stitch cables that skim along the surface down the back and sleeves. Then the real fun starts in the last step: the slip stitches become reversible on the wide cardigan fronts and collar. That’s my favourite part. My second favourite part happened by accident: I ran out of yarn. The garter stitch and cables ate up more of the dark grey and red than I’d anticipated. Luckily, I had some yellow, turquoise, and light light grey Nua on hand. And I think those colour changes actually make the sweater sing. Best mistake ever! Where did the name of the pattern come from? Originally Amanda named the cardigan, Connected Cardigan. This is a great name for the cardigan but we wanted to keep with an Irish theme with the naming so we just riffed off the name to create an Irish variant! Talamed was picked by my husband Joe who was laying out the book. The word ‘Talamh’ in Irish means earth so we varied it a little to the word Talamed. 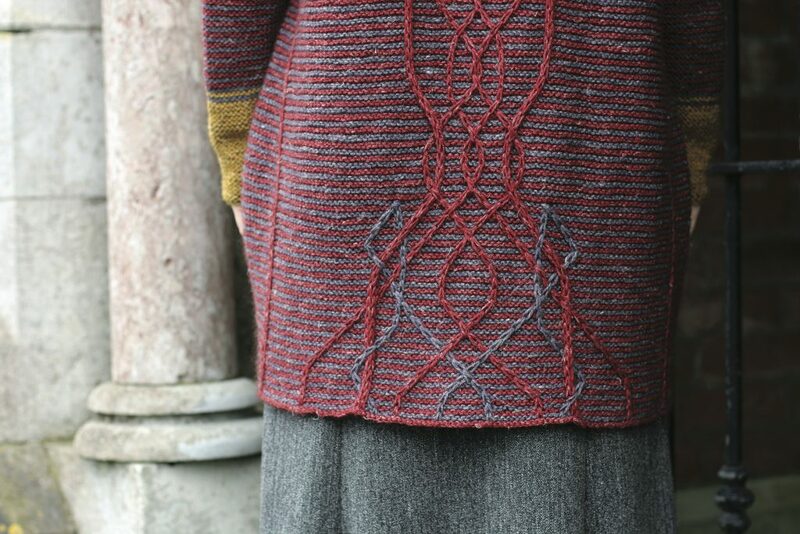 Your original name of ‘Connected Cardigan’ was the starting point of this as the the earth/soil connects everything together so it seemed like a nice way of creating an Irish variant on the English name. What level of knitting experience would you need to knit this cardigan? I’d say it’s fairly spicy. The basic framework, like I said, is simple, and the finishing is minimal, but the cables and the “at the same time” instructions add a layer of challenge. If you can follow a chart carefully, though, you can knit this sweater. When knitting Talamed, do you have any tips for knitters to take care or watch out for? All my tips are included the pattern. I will offer some extra encouragement: the cables flow logically. As you follow the instructions, look for the flow and rhythm, and you’ll eventually be able to anticipate the next steps. The sweater is knitted with Nua yarn, do you have any tips for knitters working a garment with Nua? Oh my goodness. Prepare to be very, very happy. I loved it. It was so lovely in my hands as I knit. I did have to resist the urge to pull out the linen fibres (I have to resist the urge to remove the nups in tweed yarns, too). The finished Talamed sweater has a normal bit of a weight to it (less, considering it’s a long sweater), it’s heavenly soft and cozy, and the drape is perfect. I will live in this sweater this fall and winter. The wide collar is warm and comforting, even on my sensitive skin. Carol has knocked it out of the park with this yarn. Thank you so much Amanda, for taking the time to answer some questions on your Talamed design for Echoes of Heather & Stone. If you would like to hear more from Amanda you can find her over on her website Aknitica.com and on Instagram, Twitter and Facebook and you can find more of her beautiful designs on Ravelry here. There will be more upcoming releases from Echoes of Heather and Stone coming soon and if you want to be one of the first to hear about the books release dates and launch party then sign up to the Stolen Stitches newsletter here. You can read previous posts about Echoes of Heather & Stone here and the book is now available for presale here! Come listen to us chat on Instagram live!